Search.youronlinegamecenter.com is the PUP that uses misleading techniques to prevent removal. Use Reimage to locate malicious components and get rid of them faster than with uninstall instructions. A full system scan blocks virus reappearance and prevents traffic to malicious domains. How to stop Search.youronlinegamecenter.com redirects? How did Search.youronlinegamecenter.com hijack your computer system? 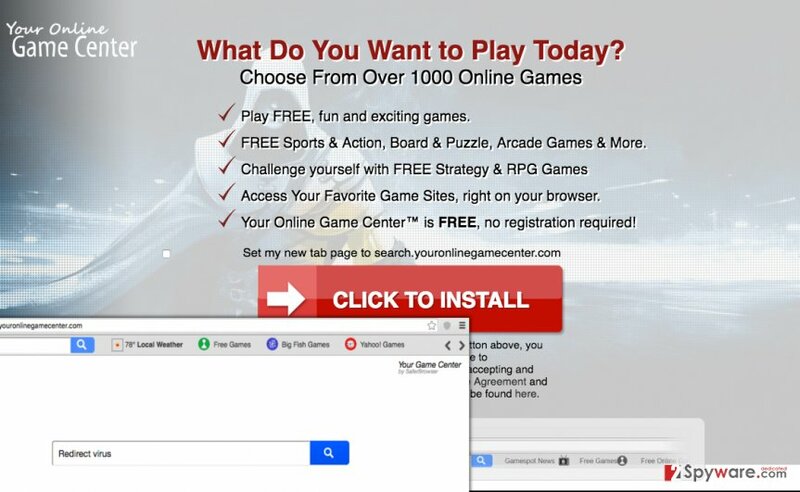 If suspicious websites open up in your web browser unexpectedly, Search.youronlinegamecenter.com virus (by Safer Browser) might be the one to blame. This potentially unwanted program (PUP) is actively distributed alongside other free applications and can be installed without user’s knowledge. We have assigned this program to “browser hijackers” category since its primary function is to affect web browsers and set Search.youronlinegamecenter.com as homepage in them. This site suggests using Your Online Game Center search engine, which is highly unreliable. If you are reading this article, we are sure that you have already had a chance to experience redirects that this shady search tool causes and that they typically lead to suspicious-looking Internet sites. This hijacker causes redirections to predetermined Internet sites with the intention to promote them. The more redirects it can cause and the more users it can push to visit certain Internet sites, the more money the developers of this hijacker earn. What is even worse, these redirects can lead you to malicious and very dangerous websites, and if you are not attentive enough, you can be deceived and talked into installing bogus software updates, apps, or providing personal information. Untrustworthy websites also provide advertisements, and clicking on them can be dangerous. By browsing through unknown and possibly insecure third-party websites, you expose your computer to cyber risks and risk ending up on sites operated by cyber criminals. If you wish to protect your computer, it is better to remove Search.youronlinegamecenter.com redirect virus, as it is a highly untrustworthy program. It is always better just to rely on a well-known and reputable web search provider such as Google. Speaking about the removal, it is not enough to modify homepage settings in your browser in order to make this page disappear. It is operated by the browser hijacker, which is an application, therefore, you need to uninstall it. We recommend using Reimage anti-spyware software to uninstall this hijacker from your PC. If you have more time and patience, you can opt for manual removal option. At most times, users don’t install apps like Your Online Game Center by their choice. Most likely, you can end up on this site after clicking on an untrustworthy advertisement, or after installing another unreliable program. Commonly, such programs are distributed in conjunction with other programs, usually games, download managers, media players, file format converters, file mergers, and similar programs. Such programs are mostly free, but their developers need to earn money somehow. That is why they agree to promote such questionable free applications like this browser hijacker. Besides, such programs are often ad-supported. Therefore, if you have noticed pop-up ads appearing on the computer screen, you might also want to scan your computer for adware. Follow Search.youronlinegamecenter.com removal guidelines (provided below) and uninstall it manually. Choose whichever option looks the best to you and delete this controversial program from your computer without a hesitation. Here, look for Search.youronlinegamecenter.com or any other recently installed suspicious programs. Wait until you see Applications folder and look for Search.youronlinegamecenter.com or any other suspicious programs on it. Now right click on every of such entries and select Move to Trash. When in the new window, check Delete personal settings and select Reset again to complete Search.youronlinegamecenter.com removal. Once these steps are finished, Search.youronlinegamecenter.com should be removed from your Microsoft Edge browser. Here, select Search.youronlinegamecenter.com and other questionable plugins. Click Remove to delete these entries. Now you will see Reset Firefox to its default state message with Reset Firefox button. Click this button for several times and complete Search.youronlinegamecenter.com removal. Here, select Search.youronlinegamecenter.com and other malicious plugins and select trash icon to delete these entries. Click Reset to confirm this action and complete Search.youronlinegamecenter.com removal. Here, select Extensions and look for Search.youronlinegamecenter.com or other suspicious entries. Click on the Uninstall button to get rid each of them. Here, look at the Homepage field. If it was altered by Search.youronlinegamecenter.com, remove unwanted link and enter the one that you want to use for your searches. Remember to include the "http://" before typing in the address of the page. Now you will see a detailed dialog window filled with reset options. All of those options are usually checked, but you can specify which of them you want to reset. Click the Reset button to complete Search.youronlinegamecenter.com removal process. This entry was posted on 2016-07-27 at 03:35 and is filed under Stealing programs, Viruses. You can quickly scan the QR code with your mobile device and have Search.youronlinegamecenter.com virus manual removal instructions right in your pocket. How did you remove Search.youronlinegamecenter.com virus?